Made fresh all day, every day by our skilled juice baristas, DeCicco & Sons Juice Bar in Armonk, Larchmont, and Millwood will soon become your go-to destination for the most delicious shots and juices. If you’re always looking for your daily dose of organic fruits & vegetables, our Juice Bar offers limitless juice options to help you concoct your new favorite beverage. Stumped on what to include in your drink? 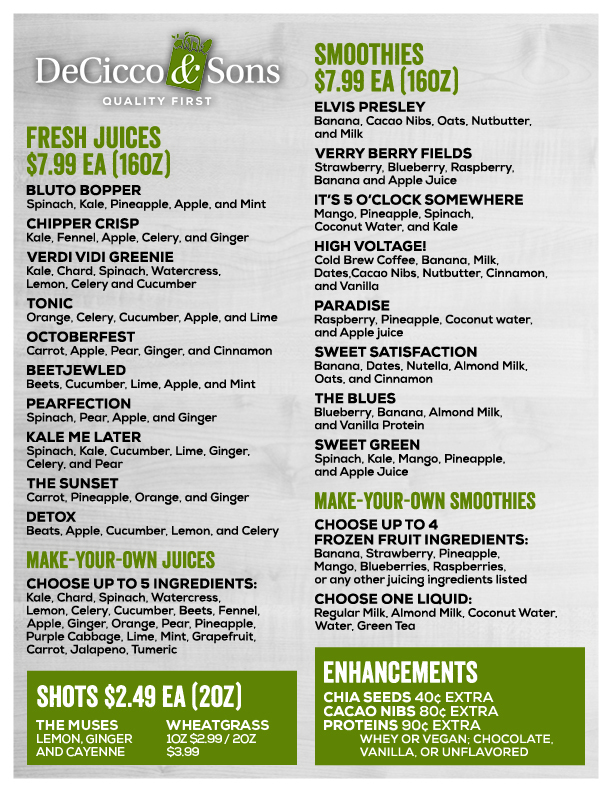 Pick from our delicious selection of specialty juices and shots on our menu (see below). What you see here is only the beginning so keep an eye on our Juice Bar, your home for tasty beverages, huge health benefits, and limitless options.